Last week the Breast Cancer Research Foundation's Annual Hot Pink Party Raised over $5.5 Million for Research. One of the most anticipated events of the season, the event raised over $5.5 million for breast cancer research. 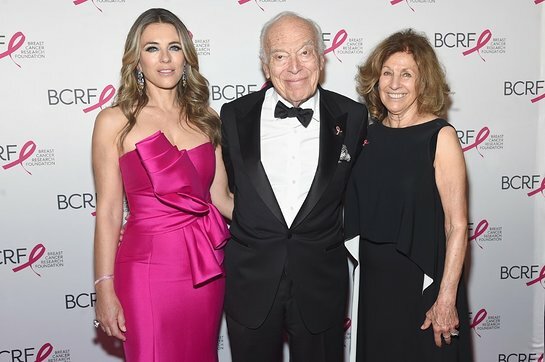 Emceed by Elizabeth Hurley, the event featured Honorary Co-chairs Leonard and Judy Lauder, a performance by nine-time Grammy Award-winner and two-time Oscar nominee, Mary J. Blige, and a video message by long-time supporter and event Honorary Co-chair Elton John. The evening honored Denise LeFrak, who was presented with the Roslyn and Leslie Goldstein Unsung Hero Award by Roberta Model Amon. Over 1,100 guests attended this year’s aquatic gala designed by Rafanelli Events, themed “New Depths”, which was a nod to BCRF’s researchers, who take a “deep dive” into the mysteries of cancer, with far-reaching outcomes. Noteworthy guests included LL Cool J, Misty Copeland, Dee and Tommy Hilfiger, Amy Robach, Jeff Gordon and Ingrid Vandebosch, Nina Garcia, Carolyn Murphy, Brian and Amy France, Daniel Basso, Paul Shaffer, Andy Karl and Orfeh, Lea DeLaria and Emma Myles. “I’m so proud to be part of BCRF’s Hot Pink Party and show my support for this incredible organization. On behalf of women around the globe, I’m honored to join BCRF in its noble mission to end breast cancer.” said Mary J. Blige.